DMX Output is only available on Resolume Arena! Resolume Arena can output the color or brightness of your pixels to LED strips or other light fixtures via DMX. This means you can play your videos on low resolution LED strips or other lights that support DMX input. Make it part of your stage design and take charge of the lights as well as the video. To do anything with DMX Fixures, first you will need to create a DMX Lumiverse. 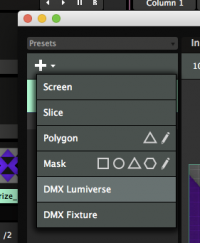 A DMX Lumiverse is basically a DMX universe, except it only exists virtually, within Resolume. 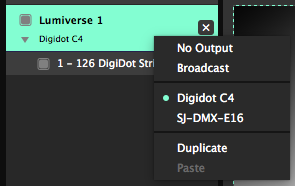 Like a regular DMX universe, it consists of 512 channels. You use a Lumiverse to arrange and order your fixtures. This way, you can prepare your pixel map at home. When it's showtime, you can then quickly assign a whole Lumiverse to the actual Art-Net node. Also, you can quickly change between different nodes, without having to rebuild your pixel map from scratch. Tip! Lumiverses are not a common DMX term. They're just used within Resolume to organise your output. Don't use the word Lumiverse when talking to your LD buddy. He'll think you've been smoking the funny baccy. You create a Lumiverse simply by adding one via the + menu. A Lumiverse has the same Opacity, Brightness, Contrast and Color options that a regular Screen has. They behave the same way. In addition, it has a Framerate and Delay setting. The framerate determines how often (per second) you send out the Lumiverse data. Higher values make fixtures more responsive but are more performance intensive. You are sending more data per second down the cable. 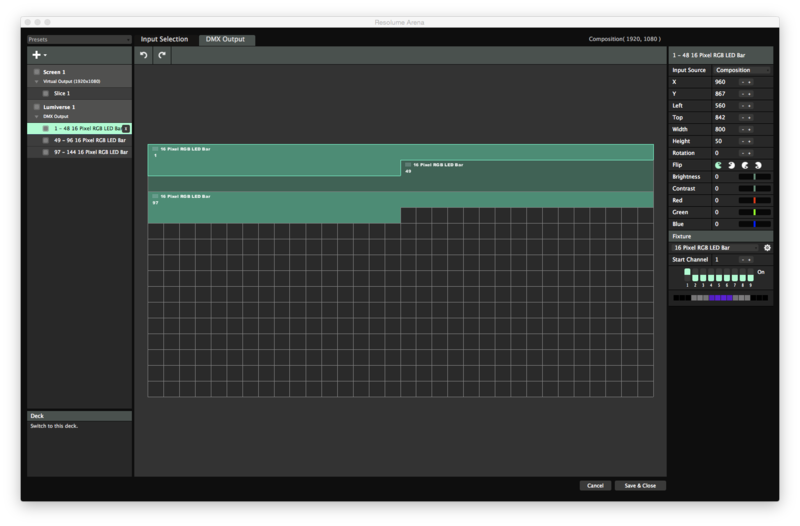 The delay determines the time between rendering the frame and outputting it to DMX (in milliseconds). This is used to keep lights/projectors in sync. The default value of 40ms will give a good result when matching lights and projectors. When using Resolume to control pixelstrips or lights only, you can change this value to 0 for immediate output without delay. When you first create a DMX Lumiverse, it will create one default DMX fixture for you. The default fixture contains 1 pixel of RGB data. Unless you're controlling the sun via DMX, it's quite likely you'll need to use a different kind of light fixture than a single RGB pixel. You can select a different fixture preset by selecting the fixture and using the drop down on the right hand side. Tip! If your fixture is not in the list, don't worry. You can very easily and quickly create your own fixture presets. You'll probably want to read the Fixture Editor page first. Let's say that you have a set of three LED tubes. Each tube has 16 RGB lights and they're arranged in a triangular shape on the centre of the stage. The first thing to do is to change the default fixture to the corresponding entry from the list. You'll notice that the fixture name has changed. Also the Input Selection area of the fixture has become 16 times as wide. This is because you can now assign colours for 16 pixels, instead of only 1. You can move, scale and rotate the input of this fixture to match the physical location of the light in your stage design. Let's make it 800x50 pixels. Assign its input to the bottom centre of the composition by placing it in the bottom centre of the Input Selection window. 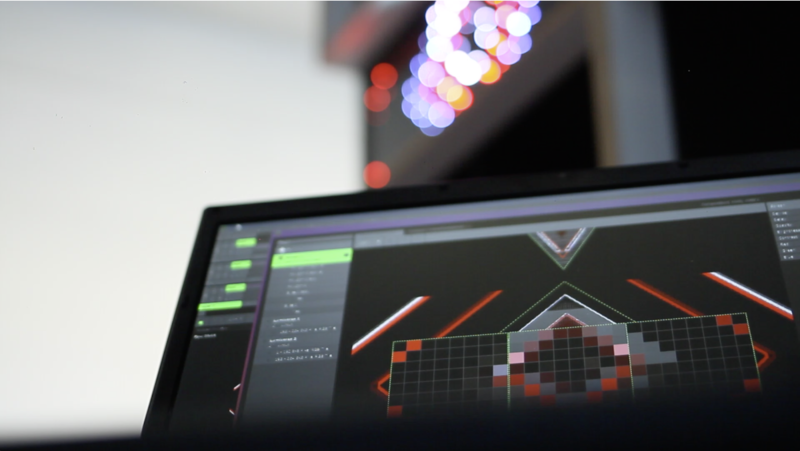 Resolume will sample the very centre pixel of each square as input for the RGB channel. You'll see exactly which colours it’s sending in the preview on the bottom of the slice info. Tip! Of course changing the input size in pixels doesn't change the size of the LED tube. Also the location in the composition doesn't change anything to its physical location. But it makes sense that you need to match the input size and position of your other stage elements, such as projection surfaces or LED wall tiles. This will create a matching picture on all your screens and lights when you start playing video on them. Create another DMX fixture via the big + drop down menu. You’ll notice that this new fixture is also a 16 pixel LED bar. Resolume will take the previously used fixture as the default for newly created DMX fixtures. Make this fixture the same width and height as the previous one, but rotate it to -60 degrees. Place it so that it makes the left leg of a perpendicular triangle. Create the third fixture by duplicating the second fixture. You do this by right clicking on the fixture, either in the list on the left or in the Input Selection canvas itself. Rotate it to 60 degrees, and use it to finish off the triangle. Tip! Use the scroll wheel or CTRL + and - ( CMD + and - on a Mac ) to zoom in and precisely position your fixture slice. You can use the pan tool or hold down spacebar to pan the canvas. After setting up all your inputs, it's time to actually send out some output to your LED tubes. Right-click on your DMX Lumiverse. Just like with Screens, Resolume will show a list of the detected Art-Net nodes on your network. Simply select the name of the node you want to use and Resolume will fill out the complicated parts like IP addresses and universes for you. Tip! If your device doesn't show up in the list, make sure the IP of the device and the computer running Resolume are in the same IP range and are using the same subnet mask. It could be that your computer has both a wired and wireless network interface. If your Art-Net nodes are on your wired network, but Resolume is looking on the wifi, it won't be able to find anything. You can make sure Resolume is looking on the right network via the DMX tab of the Preferences. It could be that you're using some sort of homebrew Art-Net device, like an Arduino. In that case, it probably won't show up in the node list, but you will still be able to send Art-Net to it. On the right hand side, choose IP Address from the Target IP dropdown. You can then fill out the IP manually. Remember that in this case, you will need to set the Universe and Subnet manually as well. For most devices, Universe 0 on Subnet 0 is the default setting for the first port. When sending Art-Net to a specific named node, Resolume will remember that node's name, and keep sending to it, even if its IP address changes. When sending to a specific IP address, Resolume will keep sending to that IP, even if the device changes or if there's nothing there anymore. Instead of sending to a specific node, you can also broadcast DMX to all the devices on your network. If sending to a single node is like addressing a request to a person by name ("Hey Bob, could you take out the trash please? "), broadcasting is the same as shouting really loud and hoping that someone will listen ("SOMEONE NEEDS TO TAKE OUT THE TRASH! LIKE, NOW!"). When broadcasting, there is no need to set the IP, but you will need to set your Subnet and Universe accordingly. When you start hitting 30 universes or more, it's a good idea to stop using broadcast and using gigabit switches and unicast instead. Resolume Arena 6 does not support Enttec DMX USB devices. If you'd like to use an Enttec DMX USB device, your only option is to stick with Arena 5. 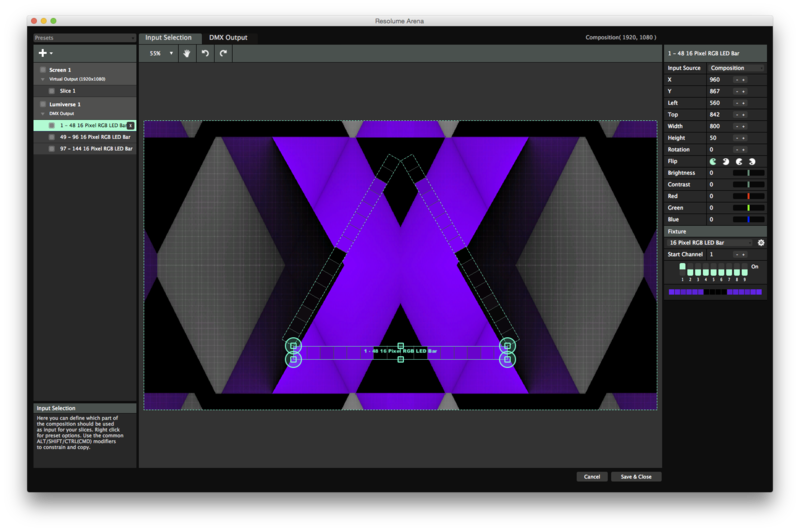 Because USB boxes are limited to one or two universes, Resolume only supports Art-Net based solution. Showjockey and several other companies have boxes to get up to 8 or even 16 universes of DMX over a single Art-Net connection. If you're not afraid of some DIY there are also plenty of cheap alternatives. 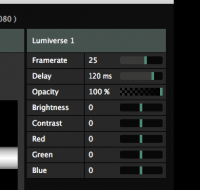 Switch back to the Screen Setup, select your Lumiverse and switch over to the DMX Output tab. The DMX Output is the overview of how your fixtures are arranged in your Lumiverse. You'll see that the first fixture takes up 48 channels. This makes sense, as it has 16 pixels, each with a R, G and B value ( 16 * 3 = 48 ! ). The second fixture starts at channel 49, right after the first one finishes. The third fixture starts at 97. These Start Channels should correspond to how your dip switches are set up on your LED tubes. 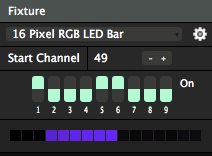 This way Resolume knows which set of pixels need to be sent to which tube. Tip! You know there's 10 kinds of people in the world. For those of you that can't count in binary, you can see how your dip switches should be set up visually in the bottom of the fixture info tab. If your LED tubes are set up differently, you can simply drag the fixtures around in the DMX Output window. You’ll notice the Start Channel and the dip switches update themselves accordingly. If you prefer, you can adjust your dip switches directly or just type in the Start Channel. Your fixtures will then arrange themselves in your Lumiverse. Just make sure the channels do not overlap, otherwise you might get weird results. Resolume will warn you when this happens, by marking the overlapping channels with red. After you have set up the correct start addresses, your LED tubes should correspond to what you're playing on them. If one or more tubes were placed upside down or the wrong way round, you can use the Pacman icons to flip their output. Also you can adjust their brightness and contrast should that be necessary. To check whether your outputs line up correctly, you can use the Test Card from the Output menu. The test card has a diagonal line moving across the screen, so you’ll quickly notice if your LED tubes are somehow placed different in the physical world, than how you placed them in the Input Selection tab. If something is wrong, first make sure the Start Channels match up using the DMX Output tab. Also, it might be necessary to use Pacman to flip the output horizontally and/or vertically before it's sent to the fixture.